Blepharitis is inflammation of the eyelids, and for many this is a chronic condition. It is a common condition that affects both adults and children. There are two kinds of blepharitis – anterior (front) and posterior (back) blepharitis. Anterior blepharitis affects the front of the eye, including the eyelid and eyelashes. It is often associated with a bacterial growth and/or an increase in the activity of the meibomian gland. Posterior blepharitis causes dry eyes and is created by the dysfunction of the meibomian gland. So it generally isn’t caused by a bacterial infection. In the eyes, the meibomian glands (also called the “tarsal glands”) are a type of sebaceous gland that secretes a special type of sebum into tears. Sebum is composed of fat, keratin, and other cellular material. It is the fatty nature of the sebum that helps protect and lubricate the eyes. Posterior blepharitis makes the sebum thicker than it should be. In some cases, blepharitis may be accompanied by the presence of styes and chalazia. Styes (or hordeola) are when either an eyelash follicle or one of the meibomian glands at the edge of the eyelid becomes infected or inflamed. 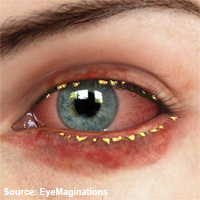 Chalazia are cyst-like bumps on the eyelids caused by inflammation due to a blocked meibomian gland. Chalazia aren’t caused by bacterial infection, and they generally take longer to disappear. The symptoms of blepharitis include itchiness, redness, a gritty feeling in the eyes, blurred vision, dry eyes, flaking, and crusting of the eyelids. Although it can be annoying and unattractive, it usually doesn’t cause permanent eyesight damage. However, in some cases it can progress and lead to permanent ocular damage. For example, the eyelid margin can become permanently altered or vision can be lost because the blepharitis leads to superficial keratopathy (abnormality of the cornea), corneal neovascularization, or ulceration. The prevalence of blepharitis increases with age. This is a problem, as the presence of blepharitis can affect the outcomes of cataract and refractive surgery. Blepharitis is generally diagnosed through an examination of the eyelids by using a magnifying instrument. In some cases, the doctor may also take a sample of the oil or crust deposit on the eyelids and send that for analysis. This can indicate whether the blepharitis is caused by bacteria, fungi or allergic reactions. Additional tests, such as a Schirmer’s test (without anesthesia), tear osmolarity tests, lissamine green and fluorescein staining, and meibomian gland expression can be conducted. These can help pinpoint whether symptoms are related to dry eye or meibomian gland dysfunction plus dry eye. Some doctors also ask their patients to complete the Ocular Surface Disease Index questionnaire to determine their symptoms, environment, and overall functioning. This gives an indication of whether the condition is mild, moderate or severe in nature. Blepharitis is a complex disease, and there are many factors that affect its development. For example, it can occur because of infection, allergies, irritations or insect bites, infestations with certain parasites such as Demodex mite infestation, and inflammatory skin conditions such as atopy and seborrhea. In some cases the dysfunction of the meibomian gland in posterior blepharitis can occur because of a hormone imbalance. Some doctors ask their patients to keep a diary to track their condition. When a blepharitis symptom arises, they have to write down whether they also have a systemic condition, such as rosacea or lupus that’s become active, whether their joints are aching and how they are feeling overall. If they are women, they also note where they are in their menstrual cycle as estrogen promotes inflammation. They also note if they changed anything. For example, did they switch cosmetics or just get their nails or hair done, or start a new medication? And they note down any changes in their environment (e.g. if they started a new job or moved to a new home or took up a new hobby). This sort of diary helps both the patient and the doctor help determine the cause of their blepharitis. In many cases good hygiene (cleaning of the eyelids) can be all that is needed to control blepharitis. If the blepharitis appears to be linked to dandruff or rosacea, treating those conditions can help reduce the blepharitis itself. However, for some patients blepharitis has a tendency to reoccur, and thus it becomes a chronic condition. However, good hygiene can still help bring it under control and make it manageable. Cleaning the eyelids regularly with a dilution of baby shampoo (or something similar). Antibiotics for blepharitis caused by a bacterial infection. Steroid eyedrops or ointments to help control inflammation. Lubricating eyedrops or artificial tears to relieve dry eyes. Treating conditions which may be helping cause the blepharitis such as rosacea, seborrheic dermatitis, allergies and so on. Blepharitis is only rarely eradicated completely, and relapses are common. However, a recent 2012 study by Lindsley K, et al,2 showed that topical antibiotics provided some relief and were effective in eradicating bacteria for anterior blepharitis. Keeping the eyelids clean provided some relief of symptoms for both anterior and posterior blepharitis. But the effectiveness of other treatments, such as steroid eyedrops, ointments and oral antibiotics, were inconclusive. Do not rub the eyes. Apply a warm, wet washcloth to the eyelids and hold in place until cool. Repeat 3 -4 times per day. Discontinue use of contact lenses and/or eye makeup until you see your eye doctor. Place a drop or two of castor oil on a cotton swab and put it on the inner lower eyelid. Only use castor oil purchased from a health food store and that is freshly opened. Dilute honey with spring water and apply in a similar manner to the castor oil. At the same time, do free eye exercises to help produce tears. Mix 1/2 tsp baking soda and 1/4 tsp salt in 1/2 cup warm water. Dip your finger in this solution and rub it on the closed eyelids. Do this upon waking and before you go to bed. If you also have styes, try EyeEase Formula. If you experience any of the symptoms of blepharitis, check in with your eye doctor for a complete examination. For more information, visit our Blepharitis Support page.